Marie Kondo speaking to a sold out audience in New York City. Transforming your life begins with your sock drawer. Most people have three times more stuff than they need. All that extra clutter is making us miserable, says bestselling author and tidying guru Marie Kondo. 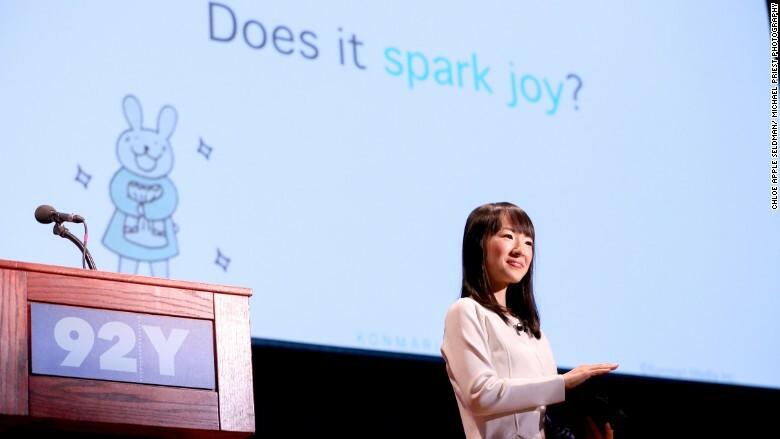 "Tidying isn't just a physical thing, it's an emotional thing," Kondo told a sold out auditorium Friday night at the 92nd Street Y in New York City. "You face things around you and you face your inner self." Kondo is Japanese and only 31, but she's on her way to unseating Martha Stewart as the world's "diva of domesticity." While Stewart just announced layoffs at her company, Kondo is on a global tour and about to launch an app. Fans come out to events to watch Kondo fold clothes and organize closets. Her cleaning revolution is based on a simple premise: only keep things that bring you joy. Her first book -- "The Life-Changing Magic of Tidying Up" -- has sold 5 million copies worldwide and made her "KonMari" tidying method a household name. She's currently touring America to promote her second book, "Spark Joy," which just came out and already has a print run of about half a million. "I am a crazy tidying fanatic," Kondo says, flashing a smile. She claims she's been that way since age 5 and even wrote her college thesis on cleaning up. By age 19, Kondo was running a consulting business where she would go to people's homes and help them de-clutter. She was in so much demand that her wait list was six months long. She wrote the book and started training others in her KonMari method. Kondo doesn't publicly disclose her wealth, but she's almost certainly a multi-millionaire between her consulting and book sales. Her first rule is to sort by category, not by location. Too many people try to tackle one closet or room at a time. Instead, she says take one item, such as every book in your house, and put it on the floor so you can truly see what you have. Step number two is to pick each item up and ask yourself "does it spark joy?" "It's important to touch every item and hold it with your hands," Kondo explains. Your body actually has a physical reaction. You either feel uplifted or you sink down. If done correctly, Kondo's clients typically shed about two-thirds of their stuff in a big "marathon" tidying up. She also has recommendations on how to store clothes and other items properly in your home. "I love folding clothes. This is a good opportunity to communicate with your clothes. This is a good way to see if there is a rip," she says. Marie Kondo demonstrates how to fold garments at the 92nd Street Y in New York City. Kondo has worked with clients all over the world, including New York and San Francisco. She says Americans don't have more stuff, but they do have bigger stuff. Tidying your home spills over into other areas of your life, too. "When you tidy your home or around you, you'll be able to hone your judgment skills, so you'll be smarter with your money as well," Kondo told CNNMoney in an exclusive interview. After people shed clothes and items that don't give them joy, she says they are a lot smarter about what to buy when they go shopping. "You will eventually be able to save money a little bit," Kondo says through her translator. As for life as a celebrity, Kondo says she's sticking with her lean and clean ways. "I don't think I've bought that much after my success because I don't have time to shop anymore," Kondo tells CNNMoney just before she heads to greet about a hundred fans lined up for her to sign their books.